I had fully intended to enter a score for the mile in the Challenge Series as an equal pace to my 2k race from Bristol last weekend. However, I was 15 minutes into a steady distance row in the garage this evening, and just fancied a go at the mile rather than the rest of the steady distance row. Partly because I didn’t think it would be too hard to beat the 1:36.6 average pace from the 2k, but probably more than I just didn’t want to do even another 15mins of slow rowing. So I stopped, set 1609m on the monitor, and set off with the simple aim of averaging under 1:36.6. This felt like a good cruise through the middle, with a lot left to give at the end. At 0.7 faster split than the Bristol 2k this puts me in a good position to go a few seconds quicker in the next 2k race in Newark. The first session of Week 9 was the first time I have done multiple back to back 1k reps in a session this season. The standard Pete Plan session is 4 reps with a 5min rest between them, and done maximally it falls about 1 second slower than 2k pace. What I wanted from this session was to really emphasise the quality of the final rep though, and also not make it quite such a fatiguing session as the 4 rep version. So the session was set at 3 x 1k / 5min rest, with a target of 1second slower than Bristol 2k pace for the first 2 reps, and a quicker final rep (with an aim to just beat the Bristol 2k pace). So the first 2 reps should then fall right at the pace a maximal 4 x 1k session would be performed, allowing for the quicker final rep. This gave me a target pace of 1:36.6 (Bristol 2k pace) + 1 = 1:37.6 for the first 2 reps. As I do feel I have made a step forward this week though I didn’t mind going a little quicker than this, but I wanted to ensure that the primary training point of the session, the fast final rep, would still be possible. As with the last 2 core sessions, this session went well. 2 weeks ago, at the end of Week 6, I did a 30 minute time trial as one of the core sessions during my build up to Bristol. I worked hard, and managed a score of 8432m, at a pace of 1:46.7 at 28spm. It was a tough row, and I even had to drop down to 1:48.1 for the second to last 5min split to help get me through to the end. Today was a steady distance day following the tough 10 x 1k reps session yesterday. But after the technical discovery and changes made during that session I wanted to test out for sure whether I had made some gains. So I decided to make my steady 30mins into a bit harder paced 30mins. Not a time trial type intensity, but I wanted to see if I could just beat the 30min TT distance without having to work too hard. So we set the record, that still stands today, at 6 hours 24mins 38.3 seconds, or an average pace of 1:55.3 between the two of us. I hadn’t prepped specifically for such a duration, and the 52km or so that I rowed at around 1:50 pace really took its toll on my body. I was suffering pretty badly with cramp over the last hour or so of the row, and having to compensate in terms of technique to keep the flywheel spinning. Why am a discussing an event that was nearly 3 and a half years ago? It was during that 100km row that in the final 25km Jen’s husband Ian asked me if my left ankle was ok. I was doing some strange movement with my left ankle during the second half of every leg drive, probably due to muscle fatigue, cramp, and anything else that might happen to your body with such extreme duration exercise that you’re not used to. I hadn’t given this another thought until 2 days ago. I had noticed on occasion this odd movement of my ankle over the proceeding 3 years and not really thought anything about it, or considered the relation to the 100k row. I only started thinking about it after the Bristol races last weekend when someone commented to me after the race that “you do something odd with your left foot during the stroke, and you must be losing power because of it“. That’s the bit I’d never thought about before, but was the catalyst to actually analyse what I’m doing, what is causing it, and how I can fix it during the past few days. During my steady distance row yesterday I spent the first few minutes watching my left foot, and seeing what was happening. Around half way through the leg drive my foot would roll outwards and almost completely lose contact with the foot plate. Not a gradual row, more of a sudden flick during the drive. For the next 10 minutes I concentrated hard on trying to find the right movement pattern to minimise this ankle movement, and keep the power I was generating going into the footplate. Afterall, if my foot isn’t in contact with the footplate then I get no power generation from that leg at all, and that is not a good thing! If I consciously made sure to keep my left foot in contact with the footplate throughout the drive I went quicker for the same perceived effort level. But the ankle flick had become an ingrained movement over the past 3+ years, so it took energy to concentrate on trying to remove it. It was only after that steady distance row yesterday that I thought back to the first time I’d ever noticed myself doing this, that 100km row back in May 2010. Today was the first hard session that I had to try to maintain this technique improvement and see what effect it could have. The session was to be a 10 x 1k / 1min rest. I had done a very similar session in Week 2 of this training plan with an 8 x 1250m / 1min rest session. That was 5 weeks ago, and I had been unable to keep all reps under 1:45.0, but just managed to get the average there with a 1:44.8 with the majority of the reps at 30spm. So the target today was to get all 10 reps under 1:45 pace, and therefore give me a good feeling that I was moving in the right direction. I concentrated hard on my left ankle during every rep making sure to eliminate the twist as much as possible and keep my foot planted on the footplate throughout the drive. The session went better than I could have hoped. The first 2 reps were at 1:44.0 and 1:43.9 pace. A second improvement in pace at a rate of 1 to 2 spm lower. I would take that improvement in 5 weeks if it was just due to an increase in fitness. But I really believe that a fair portion of the improvement is due to the technical discovery and improvement, and that this could be a big breakthrough in my erging times. I have felt like I have under-performed compared to the effort I seemed to be putting in to my training during periods over the past few years. Yes I have had a lot more constraints on my training during that time, but I have had long periods of good solid training without reaching levels that I could get to previously. It will take some concentration over the next few weeks to make sure this technical change becomes sub-conscious routine, but I think it will be worth it. The final week of training last week before my first race of the season went well. The week began with a repeat of the 4 x 800m session I’d lt done in week 2 of this phase of training. Now in week 5 I expected to make a reasonable improvement on the paces I’d achieved 5 weeks before, and it went right on plan. 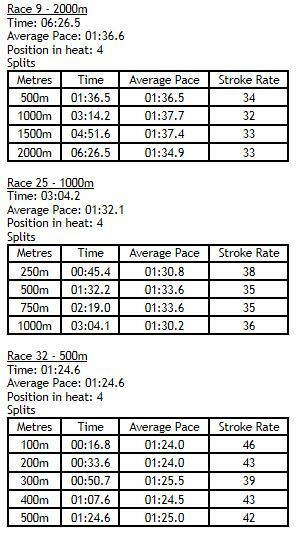 Wednesday was then billed as the final harder metres before the race, and planned as a 4 x 1250m / 4min rest session. Unfortunately time constraints that evening meant I had to cut the session short by 1 rep, so went for a higher quality third rep to compensate. I did do a couple of steady rows around these, on the Tuesday and Saturday, but I tend not to blog these as they aren’t that interesting. For completeness I will try to at least include the bare details of even the steady sessions from here to BIRC, even if only for my own record. Thursday and Friday were then complete rest days from the erg before race day on Saturday. My first race was scheduled for 1145am. I therefore wanted to start my warm up at 1120am to allow for 15 minutes of warm up completing 10mins before race start time. The venue had an equal number of warm up machines to race machines, but that was as far as it went. Of the 8 or so warm up machines only one or two appeared to have working monitors, and one of those had a maximum drag of 103 at damper level 10. So the warm up had to simply be 15 or so minutes with no real idea of what drag I was rowing on, what pace I was doing, or what stroke rate I was doing it at. But I warmed up, did a few bursts at a faster unknown pace, at a higher unknown stroke rate, and was sweating nicely 10mins before race start. Onto the race machine then, and I adjusted the footplates and set the drag (to 130) and did a few strokes to get used to the machine. My pre race plan was to do 6 or 7 hard strokes, then settle onto a mid race pace of 1:37 / 1:38, with an aim of letting the average pace drift up to around 1:37.0, hold it there, then pull it down with a fast finish. My pre race target time was 6:26. So into the race and I got a good start, but the average pace seemed to take a long time to bring down. I was a bit behind where I expected to be because of it, but just accepted it and stuck to my plan of pulling 1:37 / 1:38 throughout the middle of the race. From memory the highest my average split got to was 1:37.3 at about 750m to go. I was still feeling pretty good at that point, so it was time to treat it like the last rep of an interval session. I gradually tried to nudge the pace down, and pushed hard in the last 200m to try to make my ultimate target. I timed it a little badly in that I was still rowing strongly and well under my average pace at the end, and I missed out on the time I really wanted by 0.6seconds. Final time: 2k = 6:26.5, 4th place in the 30-39 hwt. So what do you really do when you’re racing three times in a day, and have a three hour break between the first two? Well, I had packed a healthy lunch to bring with me, but a few of us really wanted a break from the venue to recharge before the 1k and 500m races later in the afternoon. So my nutritious refuelling meal between the 2k and 1k races consisted of a large slice of pepperoni pizza and a 7-up from Costco up the road. Not really the diet of an athlete I guess, but then I have never pretended to have that! The second race up was the 1k. I knew roughly what I could do having done a hard 1k for the CTC challenge last month at 3:04.0, and having just rowed a 1:36.5 paced 2k that would predict a 1:31.5 paced 1k when fresh. So low 1:32s seemed about the place to pitch it for, with a plan of 7 or 8 hard strokes this time, then settle to 1:33s and some 1:34s, then try to speed up again towards the end. I warmed up on the same monitorless erg, doing the same unknown paces and rates for something like 8 to 10 minutes this time. Yes, I would always tell people that warm up duration should be proportional to the intensity of the race distance, so a faster and shorter race needs more warm up. But after a hard 2k you don’t really feel like doing a lot of warm up. Into the race and what seemed like another pretty good start, but another slow to catch up average pace. But I stuck to plan, went off hard for a few strokes, settled to mid race pace, and then actually felt good coming into the final 400m. I finished strongly again, so again should have gone just a bit harder a bit earlier, but finished with a good time under the circumstances. Final time, 1k = 3:04.2, 4th place 30-39 hwt. Another hour break, another monitorless warm up. This one was even shorter, perhaps 5 to 6 minutes, but I convinced myself that my muscles were still warm from the 1k race an hour before. I had done nothing fast in preparation for a 500m race, so really had no good idea what I should be able to achieve. Taking a 1:32 pace from the 1k in comparison to pb times would equate to about a 1:24.6 for 500m when fresh (a differential of 7.4 seconds in pace, the same as between my pbs at the respective distances). But my plan was to simply go off hard, try to hold the pace at 1:25, and try to finish with a time under 1:25.0. Off the start and I took a few strokes to get down to 1:16s, then bled the pace off to 1:25s. I just kept the pressure on, stayed relaxed, and counted the strokes out in my head as the distance ticked down. I felt fairly good still with 200m to go, and the sub 1:25 target was on, so I pushed with every stroke until the monitor said there were no metres remaining. Final time, 500m = 1:24.6, 4th place, 30-39 hwt. Either I recover well between races, or I didn’t push it quite hard enough in either the 2k or 1k races. All three races were pretty much the times my training would have predicted I could do as a single one off race, but I guess with the fairly lengthy times between, and being fairly good at recovering from hard efforts, I shouldn’t have expected too much drop off race to race. 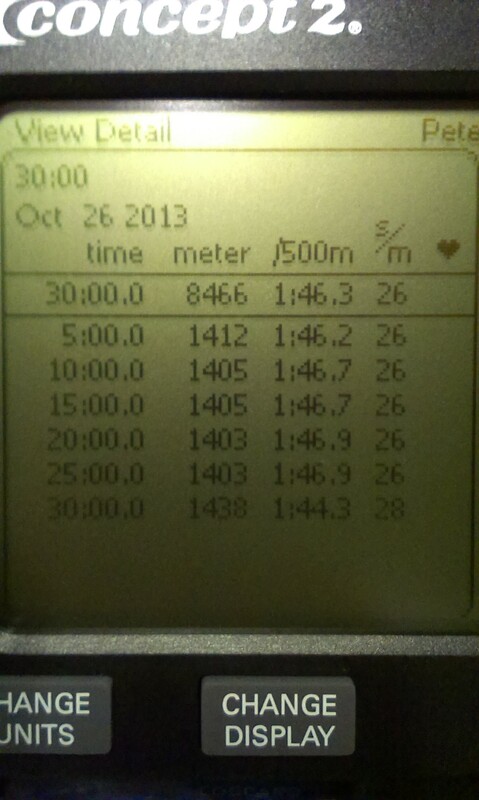 The 2k I am happy with, and now have something to build on through to Newark then BIRC. The 1k and 500m efforts were just good confirmation that I am in fairly good all around shape, and not lacking specifically at either end of the spectrum (fitness or pace), but just need to keep working across the board. 4 more weeks of training now before the next race in Newark on 16th November. The final session of Week 6, and 1 week before my first 2k race of the season. 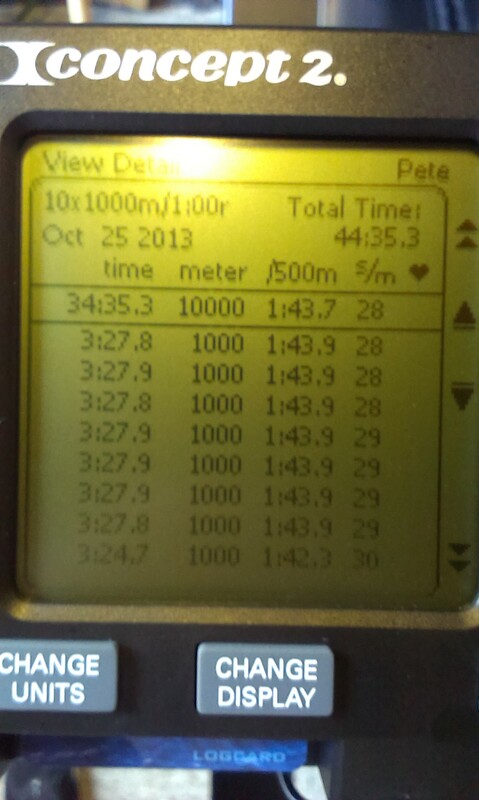 A 30min time trial on rowpro, where the weather forced me to row in the living room. My preferred place to train is outside on the patio, but rain and wind doesn’t allow that. My garage is at the bottom of the garden, so wireless internet coverage isn’t great down there and it would be too risky to try to rowpro. So that left bringing the erg in the house. Rowpro problems meant a 10min delay to starting, and a half size field of people in the row from the original lineup, but we set off in the end. I had a target in mind of breaking 1:47 average pace, so a little over 8400m. Good enough. The going got tough coming up to 10mins to go, and as I was a little ahead of target I took the option of a slight drop in pace to regroup mentally before the final push to the line. This is a season’s best pace for either a 30mins or a 10k, so it is all going in the right direction. But I am not yet strong enough mentally to push these longer distances, and should be faster. But as long as you’re moving forwards, and week on week getting closer to your goals, then you’re going the right way. I had a 3 x 2k / 5min rest session on the plan for today, a session which I had last done in the week before I began on this phase of pre-competition training. So now in the middle of Week 6 this session was last rowed 6 weeks ago. At that time I aimed for two reps just breaking 7mins, and a final rep hard. At that time I achieved times of 6:59.4, 6:59.3 and 6:45.8. In order to get a good measure of improvement I decided that I would target about the same pace on the first 2 reps, then see how much faster I could push the final rep. So the first 2 reps were 0.5 quicker pace, just because I couldn’t resist pushing them just a bit quicker than last time. The final rep I just wanted to get under 1:40 pace, which gave me a 6.2 second improvement on the final rep, or 1.6seconds in pace. For comparison, the stroke rates were identical rep for rep. I felt a bit sluggish today throughout the session, but this is a good improvement over the session, and a solid sub 6:40 on the final rep at a controlled stroke rate. A nice day today, so erg into the garden for the first core session of Week 6 this morning. Over the first 5 weeks we have done 600m reps twice, 700m reps, 800m reps, and a mixed session of 500m and 1k reps. In general the rest periods have been fairly well in proportion to the work reps, with 2min rest on the 600m reps, 2:45 on the 700m reps, and 3:30 when we did 4 x 800m reps. Total session distances so far have been 3600m (6 x 600), 3500m (5 x 700), 3200m (4 x 800) and 3000m (500 / 1k reps). So this was to be the longest total session distance of any of the Monday core sessions so far, and so pace for pace perhaps the toughest yet. We are into Week 6 now though, and our fitness and mental strength has been building throughout the past 5 weeks. My target today was 1:36.5 for the first 4 reps, then a quicker final rep. As I always do I calculated a running total of where I needed to be on the final rep to achieve my ultimate target of a 1:35.9 final average. I really need to start doing this on the total rep times rather than the average pace though, as it never seems to quick work out! Overall a good session though with 4 reps at 6:26 pace, and a much quicker final rep feeling strong at 6:16 pace (2k equivalent times). I haven’t rowed since the 600m reps on Tuesday. I said then that I was feeling like I had a lingering illness, so decided that 2 days of rest from exercise was the best course of action. I would have eased back in with a steady session today, but as some of my coached athletes were signed up for the final core session of the week on rowpro it was a good opportunity to join in. I set up my new erg in the living room (did I mention I had a new erg? ), with rowpro then on a 32″ TV rather than the laptop screen. It was a good job I decided to use the big screen as there were 16 people signed up for each of the 10min reps. The new erg is a black Model D with PM3, picked up barely second hand with less than 15k on the clock! So I have a well looked after Model D with PM4 for sale if anyone is interested? I don’t need two ergs at home! Anyway, on to the session. The target pace for this one was 1:46 to 1:47 for the first two reps and a faster last. I still have in mind that I am pushing for a 1:45 paced straight 10k though, which is why I have been doing the sessions in this progression at 1:45 or just under. But with 10min reps, and having been under the weather this week, I decided that this would be a step too far, especially with rowpro starts. So I decided that 1:46 was a better aim for the first 2 reps.